History is littered with many heinous crimes committed by man against man all in the name of power, from the Turkish genocide against the Armenians, the Nazi Jewish holocaust, Pol pot madness, the Rwandan Hutu genocide against the Tutsis and the denialism of the Shona government genocide against the largely Ndebele people of western Zimbabwe. Any attempts by anyone or any group to bring closure to the gukurahundi genocide without justice is preposterous. These graves remind us not to forget and never to forgive without justice for by doing so we render ourselves vulnerable to be revisited with another crusade of genocide. Many perpetrators of genocide around the world are still being hunted and persecuted for their crimes against humanity, the Nazis are being hauled before the courts for crimes committed more than seven decades because the evidence was documented and archived and holocaust denial is deemed a crime the world over. It astounds us why there are attempts to deny that gukurahundi mass killings are genocide and therefore a crime against humanity. They ought to be an acknowledgement that the Zanupf government committed genocide and the perpetrators held to account for their heinous crimes. These mass graves are the evidence we have that ED and his lieutenants butchered our people in cold blood. 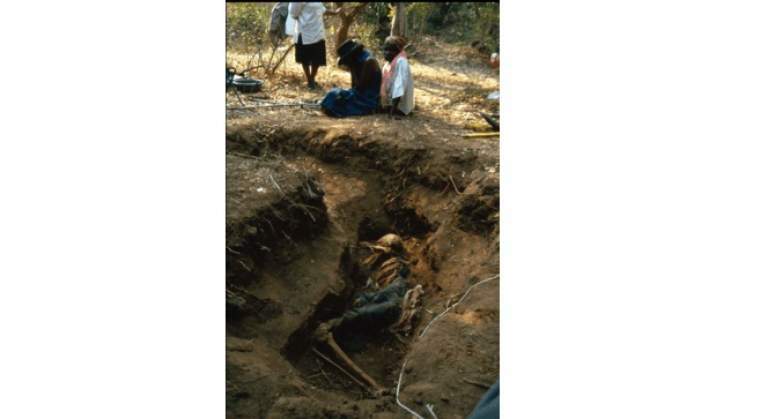 It baffles us that after the chief suspect of this genocide met with a group calling itself the Matabeleland Collective there now is an idea to exhume the remains of victims for decent reburials when there is no official acknowledgement of genocide and no accompanying commitment to persecute perpetrators. The burning question is – did the Matabeleland Collective table this proposal to the President of this illegitimate government? It now dawns to some of us why there was a huge criticism of the Mat Collective engagement with the butcher of our people as evidenced by outcries witnessed in social media. Did the collective propose mass exhumations and reburials? If they did indeed table such a proposal at the meeting, then they are guilty of appeasement and grandstanding. The citizens of the region are not wrong to believe they did as the obnoxious intent to commit sacrilege comes just after their ill-fated meeting and that such ludicrous announcement was made together with a purported government's desire to take actions to address many of the regions' grievances. Genocide graves must remain sacrosanct until we the affected communities decide what to do with them. Any tempering with them must be viewed as sacrilege which by law is a crime. Arguments advanced by some for the necessity of this sacrilegious act are shallow and should be dismissed with the contempt they deserve. Let's dispel these arguments as advanced by some apologists for the gukurahundist government: the difficulties of the victims' survivors face in acquiring citizenship documents like birth certificates and national identity documents as necessitating the tainted government's access to these graves. This rubbish. We know for a fact that survivors of those that perished in the armed struggle whose time of death as well as their graves were never known were afforded the opportunity to access such important documents. The same principle that applied then should apply to the victims of gukurahundi. The difficulty is not that their forebears were not decently buried, no, not at all. The impediment is that the genocide has not been acknowledged as a crime against humanity which warrants investigations and prosecution of perpetrators. Some victims of the genocide's graves will never be known, does this mean their descendants will still not get documentation after these sacrilegious exhumations and reburials? Some victims eloped from the killing fields with wounds and scars and died in neighbouring countries where they sought refuge. Does this mean their descendants will not be documented because their graves are not known? This is utter rubbish. The gukurahundist government, its sympathisers and apologists should acknowledge that gukurahundi was a crime against humanity and that there were attempts then and now to cover up and deny it ever occurred by perpetrators in collusion with their ex-colonial masters the British. It is therefore apparent to all and sundry that the dates of massacres, disappearances, as well as graves, will never be known. Does this mean the survivors will never have access to national documents? When genocide is acknowledged then it will be easier to acknowledge that there are victims' survivors who were minor and the need to document them will be a reality. We demand human rights for the victims' survivors. National identification documents are human rights. Another argument is that the relatives and survivors of the genocide are the ones that want to give their loved ones decent burials. This is should be treated with cynicism as many will not on their own manage to identify their remains without the help of DNA which the gukurahundist bankrupt regime will be begged to avail. If a survey can be conducted it will find that these survivors want documents for survivors and accountability more than giving them decent burials. This argument of decent funerals is a ploy to destroy evidence more than anything else. The Bambazonke regime should acknowledge that its security structures committed crimes against our people, that the guilty have to be prosecuted this will then necessitate exhumations of known mass graves, DNA testing for identification purposes. In many mass graves, it would be difficult to identify or to remember who was buried and even with modern technologies like DNA it will be a cumbersome exercise as some entire families were wiped up and some people were trucked to be executed in far away areas where nobody knew them. We may agree to mark some mass graves as shrines of remembrance rather than exhume the remains. We may decide to exhume those whom we believe are in shallow graves and re-bury them decently, but we need no help from the perpetrators with their crocodile tears. The perpetrators should help us by naming those criminals responsible for the killing of our people buried in these mass graves. The illegitimate president of the republic is the chief suspect and if he and his accomplices are genuine to bring this matter to a closure as to show that his hands are not bloodied he should use his executive powers to release the reports of the Catholic Commission for Peace and Justice report on the gukurahundi killings together with the Justice Dumbetshena commission and the 'Chihambakwe' if the name is correct, commission reports gathering dust somewhere it secret government offices. The murderous regime did not release these reports because they were found to be guilty of crimes against humanity and could not let the world know of their heinous crimes. What does decriminalizing talk about Gukurahundi massacres mean for we have been talking and writing about it along, we the affected people call for justice for the victims not exhumations and decent burials. Sanity dictates that the illegitimate government is not worth of trust and entering into any agreement with it is nothing short of folly. Records from newspapers implicate ED as the brains behind the genocide through his public utterances at rallies in Matabeleland and as the then Minister of State Security. The ruling gukurahundist government is a tyranny it planned and executed a plan grand plan unleashed its dogs of war on us in an attempt to annihilate us as a people. The evil regime continues covertly and overtly in various ways treating us a second class citizens in their misconceived philosophy of Shona supremacy. The underdevelopment of the region and the concerted effort to de-industrialise Bulawayo and employment marginalization of the region's people is deliberate. ED is a murderous crook that cannot ever be trusted. Let no one assist him in attempts to destroy evidence of his crimes. We welcome all formations to partake in the struggle for the betterment of the Matebeleland and the Midlands, the Mthwakazi nation but will not take lightly any efforts that would cover up crimes against humanity. The will never be closure, dear friends and countrymen to this dark chapter with justice. Even the prodigal son of the region Professor Jonathan Moyo wanted a bill of law on Gukurahundi which the Shona government could not accept. He fed with these murderers and championed their villainous laws that trampled upon citizens' rights and undermined democracy but could not allow the demeaning of these mass murders. Did or do the Mat Collective give thumbs up to this attempt to destroy evidence of crimes against our people? We the people of the region will not trade justice for the Mat-Zambezi Water Project. The regime's promises of an end to marginalization should be treated with skepticism as Zanupf has never kept its promises. We will not trade our human dignity for the promised end of economic marginilisation. Never. We the people will not let the murderers of our people go scot free. Never. We will endeavor to bring them to trial even posthumously, we will not rest till the justice prevails. To the collective cohort we say, "come clean, did you trade our dignity and those of our fallen compatriots for a promised redress? The crooks will promise you heaven and earth and when you concert to the destruction of their crimes they will turn their backs on you and call you all sorts of names. The four decades reign of Zanupf Shona hegemony has taught us to be wary in dealing with the Bambazonke government. The collective is free to engage the illegitimate government in attempts to ameliorate the problems we face today because of its deliberate sinister machinations but they have no mandate to cover up crimes against our people committed in the name of tribal supremacy. Crimes ought to be left to courts of law. Tempering with the graves of victims of gukurahundi genocide will be sacrilegious. In the midst of the collective, there are lawyers for human rights who ought to know this, or are they buying present comfortable living with betraying legal tennets. We the people of the region are resolved to see justice at all costs and will never bulge in this resolve and will not talk of closure without justice. If the Mat collective did accept the illegitimate regime's offer of decriminalising talking about gukurahundi they became accomplices in the intent to commit sacrilege for the realization of the Zambezi Water Project. This deed smacks of betrayal, borders on treason. The Mat collective must come clean did they agree with perpetrators of these crimes that we the people of the region will let bygones be bygones on flimsy promises of an end to marginalization? If they did they then let it be known to them that they are outcasts and represented themselves not the people of the region. We have been undermined for too long, we have been marginalized for too long, we have been terrorized by this regime for too long, we have been under subjugation for too long, we have been called names for too long. We will not be accomplices in our dehumanization now, not for bread and butter. We will not cow now after enduring so much seeking justice. Our traditional leaders must stand up against such treachery and refuses access to these scenes of crimes. Our religious leaders should speak out against sacrilege. Our community leaders, political activists and formations should come together and ask for justice. Ours learned scholars should burn candle lights in an effort to tell the world that this murderous want to cover up its crimes. We demand justice now. We demand accountability now, and redress can follow. We want civil rights for victims' survivors now and decent burials will follow the decision to prosecute. We need the end to marginalization.